If there is one unspoken rule that every woman follows, it is – “Retail therapy which is the best therapy”. Whether you have just had a fight with your significant other, or you have an upcoming event, or you’re just having a bad day, there is nothing like a little retail therapy to put that smile right back where it belongs. We all know, shopping is a personal favourite activity of (most) women. You always look for any kind of excuse to head out to your favourite store and shop just a little more. You’ll have yourself convinced that you don’t have enough clothes, or you need that new pair of boots to go along with your outfit, or your favourite celebrity’s new makeup line is out and you wouldn’t be doing her justice if you didn’t buy that lip gloss that looks just so good on her. Whatever the excuse is, you find yourself always ready for another round of shopping. Should you Become a Personal Shopper? Many people view shopping as a necessity; they get what they need and leave the store. On the other hand, for some people, shopping is a passion. They generally have good taste, a knack for picking out and creating the best outfits out of simple pieces of clothing. As a personal shopper, your main task would be to assist your clients, who have absolutely no clue how to shop well, or even those who simply have no time. Your job as a personal shopper would consist of helping your clients in clothes shopping or find clothes or accessories which would suit them and their personality, or even help give them a complete wardrobe planning and fashion makeover. While you don’t necessarily need a college degree to become a personal shopper, you do need to be qualified and have a background in fashion. Becoming a personal shopper isn’t as easy as you might think. You can’t just walk into a high fashion store and ask for a job. You need to have the necessary qualifications and degree to get the job. But this isn’t enough. You also must be personable. You have to be friendly, warm, enthusiastic, and most importantly, have good taste in fashion. Once this is established, you need to figure out your niche. Personal shopping can branch out to many different parts- you could be a personal shopper for specific high end clients, you could assist the elderly, you could be a volunteer, or even specialize in a specific area such as shoes, or perfumes, or men’s fashion. While not every company will require you to have a degree in fashion to become a personal shopper, it is preferable that you do. For this, you can get a college level degree in fashion, or even short diploma courses. This will just strengthen your CV and improve your existing set of skills, making you a desired candidate as a personal shopper. As an aspiring personal shopper, it is absolutely essential for you to keep up with all the latest trends in fashion- be it local trends, national, and even international. Fashion magazines should become your bible. You will find a lot of young, enthusiastic shoppers who have just seen the latest fashion trend on TV or on their favourite celebrity, and they would like to recreate that style fashion on themselves. Here is where you step in. You would have to be proficient in the ‘fashion language’. Helping them choose the right colors, fitting, styles is your job. Since most of these people are just amateur shoppers, you would be adding a professional touch to their shopping style experience. As you will find in any other field of work, experience is a very important part of personal shopping as well. Not only does it add points to your CV, but also helps you in gaining confidence. You can gain personal shopping experience by working in retail shops for some time. Help clients, your family and friends in their shopping experience. Learn about pricing, how the environment is in shops, how to interact with customers and make a sale. You can also do volunteer work with organisations, and help elderly clients, or any other special type of clientele. The more experienced you are, the better will be your understanding of your job profile, what is expected of you, and tips and tricks on how you can get your clients to trust you. Being a personal shopper is a job which would hardly require you to sit at a desk and work in front of a computer. This job requires you to be on your feet, be energetic and enthusiastic. You will be spending 90% of your working hours on your feet, even running around from place to place to try and create that perfect look for someone. In order to do this successfully, you have to be extremely fit, as no one would like to see their personal shopper pass out in their middle of their shift. In order to be successful at the job you do, it is mandatory to love what you are doing! Being a personal shopper is a dream come true for many, and if you have got the opportunity to live out this dream, you must do it with passion and zest! If you love what you are doing, it will shine through in your work. You can gain popularity amongst your clients. This will ensure they come back to you every time for your advice, and may also recommend other people to you. Being a personal shopper does not consist of you picking out the clothes you think are right for your client, and your clients purchasing them. If you really want to gain their trust, you have to really listen to them. Take the time to hear them out- what they have in mind, what kind of style they prefer, what are their best colors. After that, it is your job to recommend what you think will suit your clients better. But your job is only to advice, not to push your opinions on your clients. Remember never to be pushy. A client who goes home unsatisfied once, is a client lost forever. One of the major difficulties you will have to put up with, being a personal shopper, is to deal with irregular working hours. Your clients may demand a sudden wardrobe change, or shoes to go with an outfit for a late night date. You must be willing to be there for your job, no matter what the time and situation is. After all, a ‘shopping emergency’ is a real emergency! Working as a personal shopper, you will face all kinds of clients. Some will be relatively easy to work with; they are trusting, and leave their entire wardrobe in your proficient hands. These are the dream clients. But you will not always get these dream clients. Sometimes, you will be faced with particularly difficult clients. Nothing pleases these clients. You may work hard to find the perfect clothes and accessories, but in the end, the client may still not be satisfied and leave the store empty handed. The key in these cases is to be patient, and never ever lose your cool. It will not only create a bad impression of you as a professional, but also disrupt the integrity of the shop you are working for. Never show your annoyance with these customers. Be nice, be professional and try and be as understanding as possible. So, if you think you have the skill and the talent to become a personal shopper, start by grabbing a few fashion magazines, going through blogs online, brush up your skills, and step out there. 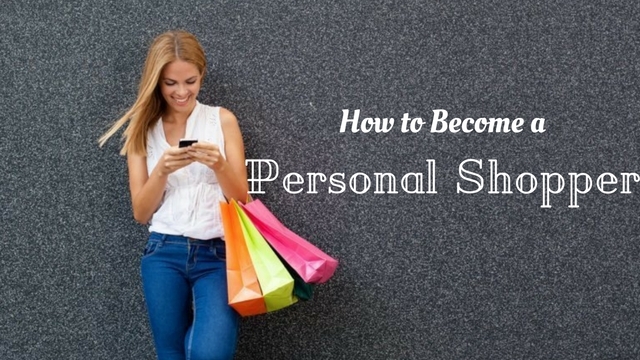 Follow the above mentioned tips on how to become a personal shopper. Get yourself a brand new outfit, and showcase your skills!